You've probably heard of knee replacement surgery, and you might even know someone who has had a hip replaced. Both are becoming more common as the large Baby Boom generation gets older. But in truth, almost any joint can be replaced with an implant to allow unfettered movement without any pain. Recently, there has been a huge increase in ankle replacement surgeries. The biggest reason patients opt for ankle replacement surgery is arthritis. Just like the knee joint, the ankle bears most of a person's body weight. And as we know, the average American is carrying around a lot more body weight these days. Dr. Adam Schiff, an orthopedic surgeon at Loyola Medicine, says ankle braces and corticosteroid injections can help relieve the pain of ankle arthritis, at least for time. But arthritis generally gets worse, and as it does these treatments become less effective. At that point, Schiff says surgery can be an option. 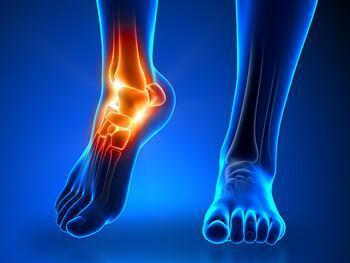 Total ankle replacement is known as total ankle arthroplasty (TAA). According to the American Orthopedic Foot and Ankle Society (AOFAS), some surgeries are prompted by normal wear and tear on the joint due to aging, or from an injury. But increasingly, arthritis is a motivating factor, as the condition wears away cartilage and leads to chronic pain. AOFAS says the surgery is an option when a patient experiences significant mobility limitations because of ankle pain after trying conservative management techniques. Patients with rheumatoid arthritis are usually good candidates for the ankle joint replacement. Patients might not be good candidates if they've suffered significant deformity or dead bone in the bottom bone of the ankle joint. Other conditions making the surgery an unfavorable option are previous ankle infections or diminished leg muscle function. In the past, the typical way surgeons have addressed arthritic ankles was to fuse the lower leg bones to a bone in the back of the foot. It eliminates pain, but also eliminates motion. And Schiff says the arthritis may return to other parts of the foot. Schiff says ankle replacement preserves motion in the joint. The joint itself is replaced with metal implants on the top of the foot and the bottom of the shin, with medical-grade plastic in the middle. Is knee-replacement surgery worth it?